Is "New Base" on the map where they plan to get to next ? "New Base" is where they parked Halley VI last year . . . then twitched about the Halloween crack to the east ('above' in the images). Halloween crack seems to show up on (ant)arctic io for 2017.11.04. Thanks for explaining FredBaer, I'll try that. I've been wanting to post this but was trying to figure out how to make the image smaller using html without success. The simple image editor on the older Macs is gone, and I want to post this without further delay, so I'll come back and fix it later, meanwhile, people can click on it to see the whole thing. Thanks Fred - seems odd they saw and marked the tracks from the earlier VI location - wonder where next ! What do you think about this photo (Ross Ice shelf)? - Is a new iceberg created? This is a theoretical study using finite element analysis, so awaits validation by observation. They find that there are certain spots on ice shelves, that when thinned, induce flow acceleration of grounded ice hundreds of kilometers away. They characterize the vulnerability by a "response ratio " . This is " the ratio between the total changes in annual mass flux across all grounding lines to the magnitude of locally applied thinning"
There are some interesting and odd things on the youtube collection as well. Campbell et al. have an unsettling result about the Ross shelf. Apparently it will continue thinning this century even absent ocean warming. This is an analysis using surface heights from GLAS and IceSAT and but all they say about the ice model is that it is a "well-tested numerical model of ice shelf flow that simulates both mass and momentum balance responses to various forcings on the ice shelf." In the light of Mercer's warning i look at 0C in antarctica around the solstice in december. So i did today. PIG/Thwaites and Amery-Holmes seem around freezing. Amery has been worrying me for a long time. Is that unusual or is it because summer is really getting starting at the south pole? This post could easily belong on many threads, but i post here because it is a new and beautiful result from WAIS divide ice core. Bereiter et al. have produced a record of mean ocean temperature since the last deglaciation from isotope fractions of noble gases. The timespan is from 24 kyr. to 7.5 kyr and from 4 Kyr to present. The unfortunate data gap is due to sample rejection. Over most of the data the time resolution is 250 yr.
"It is interesting to note that since the LGM about the same amount of energy has gone into MOT as into melting grounded ice (Fig. 3b). This is not contradicting the understanding that most of the current anthropogenic warming has been taken up by the ocean ..."
"The warming from 12,750 yr bp to 12,050 yr bp (referred to as YD1) within the Younger Dryas represents the strongest global ocean warming phase within our record. The MOT change rate is 2.5 ± 0.53 mK yr −1 and the corresponding energy uptake (13.8 ± 2.9) × 1e21 J/yr. This unprecedented natural MOT warming rate is comparable to the strong warming since 1997 estimated in ref. 1, but clearly surpasses the estimate therein for the multidecadal trend from 1971 to 2005 ..."
Zhao, L., Moore, J. C., Sun, B., Tang, X., and Guo, X.: Where is the 1-million-year-old ice at Dome A?, The Cryosphere Discuss., https://doi.org/10.5194/tc-2017-269, in review, 2018. Abstract. Ice fabric influences the rheology of ice, and hence the age/depth profile at ice core drilling sites. We use the depth varying anisotropic fabric suggested by the recent polarimetric measurements around Dome A along with prescribed fabrics ranging from isotropic through girdle to single maximum in a three-dimensional, thermo-mechanically coupled full-Stokes model of a 70 × 70 km2 domain around Kunlun station. This model allows to simulate the near basal ice temperature and age, and ice flow around the location of the Chinese deep ice coring site. Ice fabrics and geothermal heat flux strongly affect the vertical advection and basal temperature which in consequence controls the age profile. Constraining modeled age-depth profiles with dated radar isochrones to 2/3 ice depth, the surface vertical velocity, and also the spatial variability of a radar isochrones dated to 153.3 kyr BP, limits the age of the deep ice at Kunlun to 649–831 kyr, a much smaller range than inferred previously. The simple interpretation of the polarmetric radar fabric data that we use produces best fits with a geothermal heat flux of 55 mWm−2. A heat flux of 50 mWm−2 is too low to fit the deeper radar layers, and a heat flux of 60 mWm−2 leads to unrealistic surface velocities. The modeled basal temperature at Kunlun reaches the pressure melting point with a basal melting rate of 2.2–2.7 mm yr−1. Using the spatial distribution of basal temperatures and the best fit fabric suggests that within 400 m of Kunlun station, 1 million-year old ice may be found 200 m above the bed, and there are large regions where even older ice is well above the bedrock within 1–2 km of the Kunlun station. Edit: The small part was actually sea ice and not part of the ice shelf anymore. The part just hasn't broken off so early in the melting season before or sometimes didn't become ice-free at all. Fascinating, if scary. Combined with what is going on with PIG (https://forum.arctic-sea-ice.net/index.php/topic,429.msg138777.html#new), a southern "summer" to remember. and so may lead to further stresses as the ocean accesses the base there ( if the grounding line is not already there?). A nice series of pictures and videos from the Swiss Polar Institutes circumnavigation expedition in early 2017. A brittle star catching a living fish, which has never been observed before. Indeed, amazing ... takes a while, do view all of it! That looks a bit like Larsen B just before it broke up. Interesting short video on CNN about robots being used in a year-long study under the Antarctic ice. Warmth being pushed south toward Antarctica at speed today (roughly, Feb = August north of equator). Thanks for posting that, Jim. I'm not sure how useful this may be, but it looks interesting, and it's free. 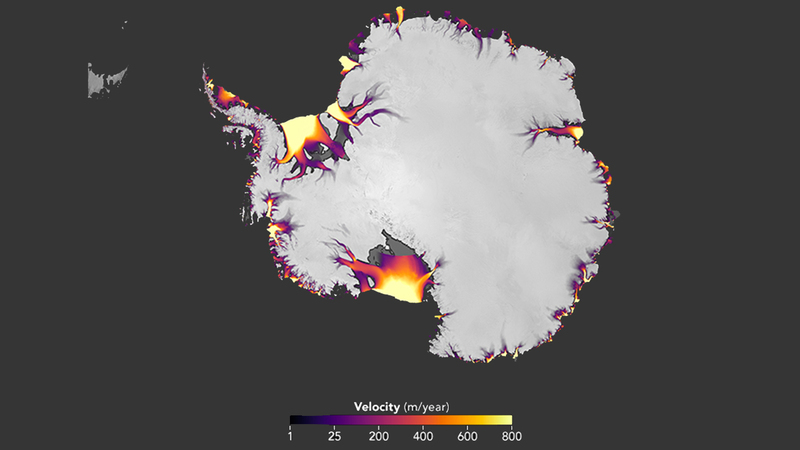 Version 3 of the Quantarctica mapping tool is released today. Quantarctica is a free package of scientific and geographic datasets for Antarctica. Version 3 now includes data from ten different scientific themes, increased from just two in version 2. An international team of scientific editors was also recruited to Quantarctica's Editorial Board, and helped review and evaluate datasets to represent their fields in Quantarctica. Nice paper by Snow et al. on changes in bottom water after a caving event in Adelie Land. After the calving Deep Shelf Water freshened resulting in not just fresher, but warmer Bottom Water. This is one of the few results from in situ measurements at the bottom of the world, covering a period from 1994 to 2015. I attach Fig3a and fig S1. The y axis on the former is density, and Fig S1 shows the process that warms and freshens Bottom Water. The Gardner paper is nice. From the table 1) i see that basins 20,21,22 (include thwaites) are showing increases in mass loss of the order of 5-7%. If I were to buy into Hansen's exponential increas picture, thats a doubling time of 10-15 yrs. We shall see. Quite a chunk of 1 y.old sea ice is breaking away in the S.E. corner of the Weddell Sea in the last few days. There seems to be off-shore winds blowing new sea ice away from the continent in many places. The off-shore ice in front of Thwaites has also been fracturing & moving out a little since late February. Apparenty a modelled rise near the grounding line may not exist, and affects features a very long way upstream. "Subtle variation in the geometry near the grounding line can trigger a response in the ice sheet that is felt hundreds of kilometers upstream." Hot core fully eyewalled up tropical cyclones raging around the coast of Antarctica. 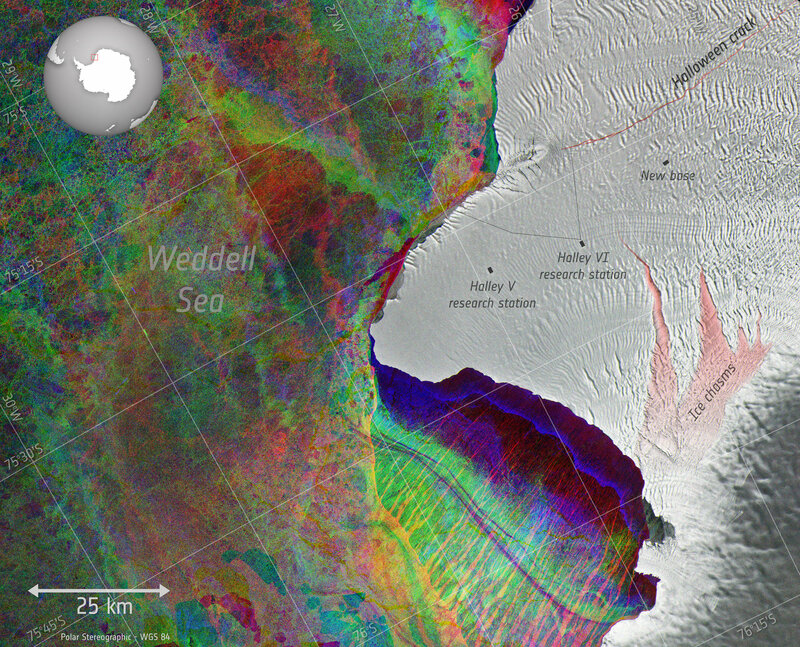 New crack in Ross ice Shelf?- I am wrong? This paper has been posted in another thread, but i include it here: Konrad et al., "Net retreat of Antarctic glacier grounding lines"
between 1996 and 2011-12 to 420 ±​ 240 m ..."
"Retreat at Pine Island Glacier appears to have stagnated at 40 m yr −1 ±​ 30 m yr −1 during the CryoSat-2 period, after it migrated inland at a rate of around 1,000 m yr −1 between 1992 and 2011"
"This leads us to conclude that the main trunk’s grounding line has stabilized, potentially due to the absence of warm sub-shelf water 36 that drove retreat until 2011." " ... high local rates of retreat of ~1,200 m/yr in our results on Haynes, Smith and Kohler glaciers are comparable to peak rates of 1,800 to 2,000 m/yr detected by InSAR between 1992 and 2014 [12,15] . In the Bellingshausen Sea, slower rates of retreat recorded over the last 40 years  are similar to those we have derived: at Ferrigno Ice Stream, rates of retreat remain in the range of 50 to 200 m/yr ; at Lidke Glacier, Berg Ice Stream and Venable and Abbot ice shelves, our rates of retreat are in the range of 10 to 40 m/yr in accordance with the multi-decadal range of 10 to 90 m/yr (ref. 13 ); and at the Cosgrove Ice Shelf, we detect no significant retreat, in agreement with previously observed rates between −​40 m/yr and +​11 m/yr (ref. 13 ). In East Antarctica, Totten Glacier is the only location where grounding-line retreat has been documented, and our result of 154 m/yr ±​ 24 m/yr retreat in its fast-flowing section is consistent with the maximum rate of 176 m/yr recorded between 1996 and 2013  ." I found some great high quality videos of helicopter flights over the McMurdo Dry Valleys. No satellite can ever reach this detail. "In the new study, Hannes and his colleagues at the Centre for Polar Observation and Modelling (CPOM) at the University of Leeds used a combination of satellite imagery and buoyancy equations to map out the invisible retreat of underwater ice across roughly 10,000 miles (16,000 kilometers) of Antarctica's coastlines — roughly one-third of the continent's total perimeter." "Scientists now have their best view yet of where Antarctica is giving up ground to the ocean as some its biggest glaciers are eaten away from below by warm water." Grounding lines are a key indicator of ice-sheet instability, because changes in their position reflect imbalance with the surround-ing ocean and affect the flow of inland ice. Although the grounding lines of several Antarctic glaciers have retreated rapidly due to ocean-driven melting, records are too scarce to assess the scale of the imbalance. Here, we combine satellite altimeter observations of ice-elevation change and measurements of ice geometry to track grounding-line movement around the entire continent, tripling the coverage of previous surveys. 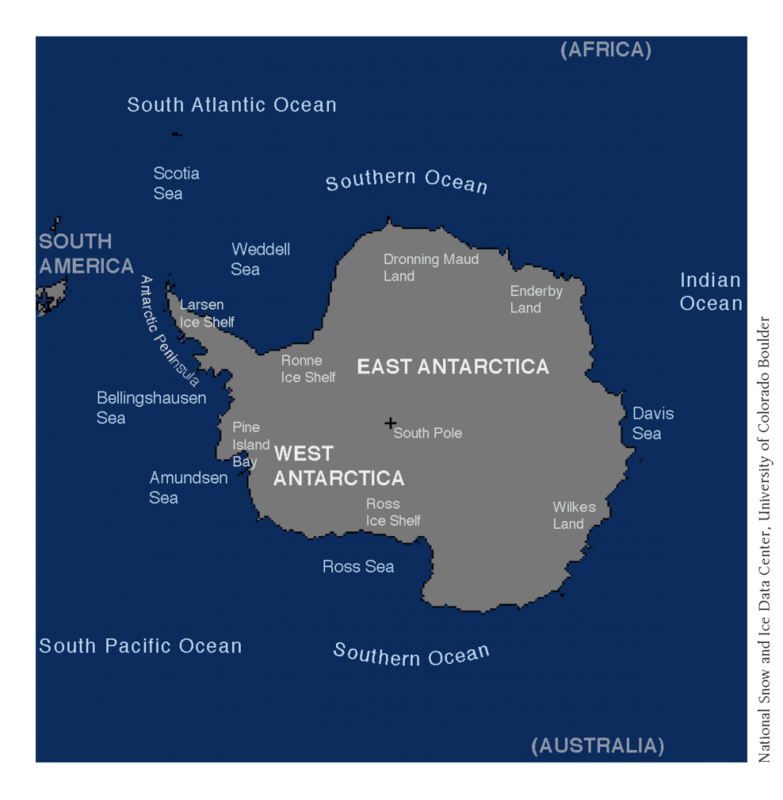 Between 2010 and 2016, 22%, 3% and 10% of surveyed grounding lines in West Antarctica, East Antarctica and at the Antarctic Peninsula retreated at rates faster than 25 m yr−1 (the typical pace since the Last Glacial Maximum) and the continent has lost 1,463 km2 ± 791 km2 of grounded-ice area. Although by far the fastest rates of retreat occurred in the Amundsen Sea sector, we show that the Pine Island Glacier grounding line has stabilized, probably as a consequence of abated ocean forcing. On average, Antarctica’s fast-flowing ice streams retreat by 110 metres per metre of ice thinning. Antarctic snow fall has since an increase since 2000 - interesting as they measure 200 years of yearly snowfails. Results from the New Zealand team's bore hole through the Ross shelf show ice growth. "However, the combined regional representation of these records is less than 30 % of the total Antarctic continent and includes single ice core sites with only limited regional representation in SMB. Our findings suggest that small changes in the high-accumulation AP, or the low-accumulation but geographically much larger EAP region, could change the sign and significance of the total Antarctic SMB trend dramatically." In other words, we're not sure. The idea is that more light meltwater enhances stratification and suppresses formation of dense saline shelf water. This allows warm circumpolar deep water to creep in and melt the ice faster. Thanks. Interesting paper, strongly grounded in observations. "On warm continental shelves, as those on the Sabrina Coast and in the Amundsen Sea, MCDW drives rapid ice shelf basal melt. The large volume of glacial meltwater prevents DSW (Dense Shelf Water) formation in polynyas downstream of the meltwater outflow. MCDW (Modified Circumpolar Deep Water) remains in the bottom layer throughout the year in the polynya and further downstream, where it can access the ice shelf cavities. On cold continental shelves, the ice shelf cavities are filled by cold shelf waters, and basal melt rates are low. Glacial meltwater input is not sufficient to suppress winter convection in polynyas downstream of the meltwater outflow, as seen at Cape Darnley Polynya, allowing formation of DSW, the precursor to Antarctic Bottom Water. " "Thanks to ESA’s CryoSat mission, a new map of Antarctica provides the most accurate 3D view ever of the continent’s vast ice sheet and floating ice shelves. This latest digital elevation model, which is available for download, is a result of research published recently in The Cryosphere. The model replaces the version published in March 2017." "Using around 250 million measurements taken by ESA’s CryoSat mission between 2010 and 2016, scientists at the UK Centre for Polar Observation and Modelling have created the most comprehensive picture to date of the height of the Antarctic ice sheet. This is about five million more than were used in the 2017 version, giving a snapshot of the height of the ice across 95% of the continent."